I’m pretty sure that his views were his own, as a reasonably avid (and quite talented) cross racer, rather than an official statement on the part of Rivendell Bicycle Works. But, I’ve kind of gotten ahead of myself, haven’t I? Leading up to this race - the first of the season on the BASP schedule - I’d done little “high-end” work and minimal running. By that test, I pretty much had no business lining up with the rest of the folks in my group. On the other hand, I’d been trying to punch things a little more on the commute miles, ride either fast or slow (staying out of the murky middle), and I felt pretty danged clean on dismounts/remounts when trying them. I’d also been trying the Anti-Costanza approach to riding. This might require a bit of explanation. I never really watched Seinfeld when it ran, grumpily saying something about not caring too much about neurotic city-dwellers’ lives. (Hey, I was younger and more opinionated). However, since it finished its run, the show - like World War II - always seems to be found, at any hour, on the television. Thus did the reruns seep into my conciousness. Somewhere in there, an episode exists wherein George decides that since everything he’s ever done has led him to his current feeble existence, his best move was to figure out what he should do and then do the opposite. There’s a beautiful kernel of truth in such logic. Enticing. Alluring. Parting of the clouds, epiphanic moment of enlightenment kinda truth. For the past year and a half or so, I’ve been on this cycle of “going well” followed by “aw crap, I’m sick again!” Now, a lot of that has had to do with work issues and the aforementioned lack of regular sleep. But, my hours have become a bit more regular of late and actually feel like I have some resilience built up. And, historically, that’s when I’ve overcooked it and slumped back down for a week or so. With the Anti-Costanza approach to training, when I feel tired or wobbly or sorta/kinda funky, I rest. Y’know, pull back and read or sleep or nap. This is revolutionary stuff. If you need to reread that last paragraph, feel free. It dovetails neatly with the way I’ve been trying to ride for the last week - either fast or slow. It’s certainly not a novel concept, and if you read about real cyclists who have real speed, they allude to it in one manner or another: once you’ve got an aerobic base in place, you want to stay out of the middle area as much as possible. Theoretically, you are either teaching your muscles and system how to go fast, or you are recovering from that effort. It’s why intervals work. Overload followed by recovery. You may have realized that I’ve been emphasizing a bit more of the recovery end of the equation. In practical terms, I’ve been slowing bringing things up until longer-ish rides don’t hammer me the way they did back in July and August of this year. When I get that feeling of, “Man! I feel good!” on a ride, I’ve eased up a bit and made sure that I took it easy. I didn’t have any preconceptions that it would somehow make me fast. And besides, I do this for fun, anyway. Which more or less brings us to the race held Sunday. The Mclaren course is interesting. As lauren wrote, it’s kind of a cyclocross course that pretends to be a cyclocross course but is really a mountain bike course. Personally, I’m kind of split on the issue, as I feel supremely confident flying down extended, narrow, bumpy-as-hell, off-camber sections on a cross bike, where my mass and lack of concern for personal safety combine in what is at times an altogether frightening episode of momentum. However, since most bike races take place using Euclidian geometric standards, stantial downhill sections generally mean that there will be climbing involved. Curse you, mass! Damn you, fickle mistress of momentum! There were two such spots on the course this year - the (in)famous “Beast” which is a runup from the start level - and the asphalt path which climbed up from the parking lot. becoming a trail to the woodsy overlook bit. Stuff we had dropped down on last year. Since the soccer fields have now been finished, they had reversed the directions a bit, and cut out some of the back and forth and up and down from the upper section 2007 Course. Start under the trees between the fields, scent of bbq brats and beer, coffee and chainlube in the air. Follow the perimeter of the baseball field to the runup. No preamble barriers this year, just off and scrum up the hillside. Hard right turn in the dust and then a little jiggle-joggle before dropping in for a downhill run. This was bumpy, curved up and contoured the hill in pedal-strike-ville, then dropped again to find the asphalt path. Asphalt path uphill, cut right to the trail and follow up and around the edge of the park (nice overlook) until it tucks under the trees. Gaining momentum, you are presented with the first challenge - bunny hop the log and gain a boatload of time, or bunnyhop the log and make the Best Crash Video. After regaining composure, you follow the spine of the hill, then enjoy a little drop and loose right hand turn, follow the bumpy S-turn down to the top-o-the-runup level. From there, you swoop down the pavement, negotiate some root cracks in the asphalt and hit the fields again. The organizers stuck a nasty little forced left-right-left set of turns on dirt infield, then you continued across the grass to line up the “Super Quad” - a set of four level barriers. Following that, you hopped back on, turned hard left and started the process again. As you can see here, there were still folks around me at this point. After lumping my way up the climb, I was ready for a short nap, but everyone kept riding and I decided to honor my preparation and keep going. For my preparation, I’d settled on a mix of half Italian and half French. My hope was that it would bring the best of Gino Bartali’s relentless climbing tenacity and Jacques Anquetil’s smooth style and ability to win regardless of how late he had stayed up the night before. Instead, it seemed to create a hybrid of a surly Vespa repairman and that French exchange student who you are pretty sure stole your best jacket. I’ll have to rethink the caffeine implementation before the next race. When we hit the downhill bit, I had the disturbing experience of catching folks who had gotten safely away from me. This was briefly heartening, until I realized that someone in the 35+ group had caught a pedal or hammered the brakes at the wrong time, and there was a bottleneck at the transition to the asphalt path. By this point, I’d reminded myself that my goal was to finish and keep momentum going through the race. This was probably a good goal, but maybe a bad strategic idea. I pulled it back a touch, well, far enough so that I no longer made the whining dog sound when I breathed, stayed seated and climbed. Got caught. Got passed. Got caught and passed. Got passed without caught being thought. Under the trees and momentum returns. Opted for the off-and-leap to deal with the log, as did everyone nearby. Tried to recover a bit on the swoop to the next bit, did the drop, muffed the turn had to order some momentum. Then before I knew it, there was asphalt under the tires and we swung down towards the ball field again. For most of the ripply grass surface, my legs were asking me just what the flip I was thinking. Couldn’t quite hit the right pace to skim over the top, and the good line bore the marks of sprinkler-induced mud. Suddenly I was lining up for the barriers and habit took over. 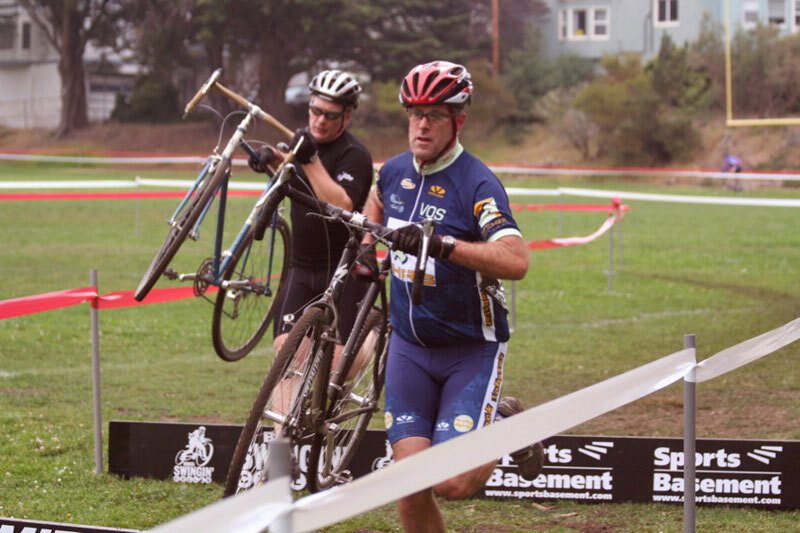 Now, there is usually a point during a cross race where you feel like complete and utter crap. You want to stop, sit down and get your breath back. I know that it’s there, and await its arrival. It probably has a lot to do with the body’s response to rocketing off the line, full of adrenaline. Adrenaline runs out, and there’s a precipitous moment where the brain forgets that there’s other fuel to run off of. As Kent Petersen once opined, “Keep pedaling, it will get better.” If you can keep going, something else kicks in and you continue. This race, interestingly enough, that didn’t happen. I actually felt a little better lap by lap, prodigous amounts of phlegm nonwithstanding. But, I never really felt that first spike and drop. Have to feel that it was actually caused by a lack of spike. But, hey. That’s what speed work is for, eh? It continued like that - hurting on the runup, big-ringing the descent, hurting on the climb, trying to recover, and then enjoying the barriers - for another four laps. Ended up fully and completely DFL in my division. Yeah, so, anyway. I did have fun, and it was actually encouraging to feel like something was left in the tank. Probably could’ve started pushing things a lap earlier or so, but that’s always easy to say after the fact. 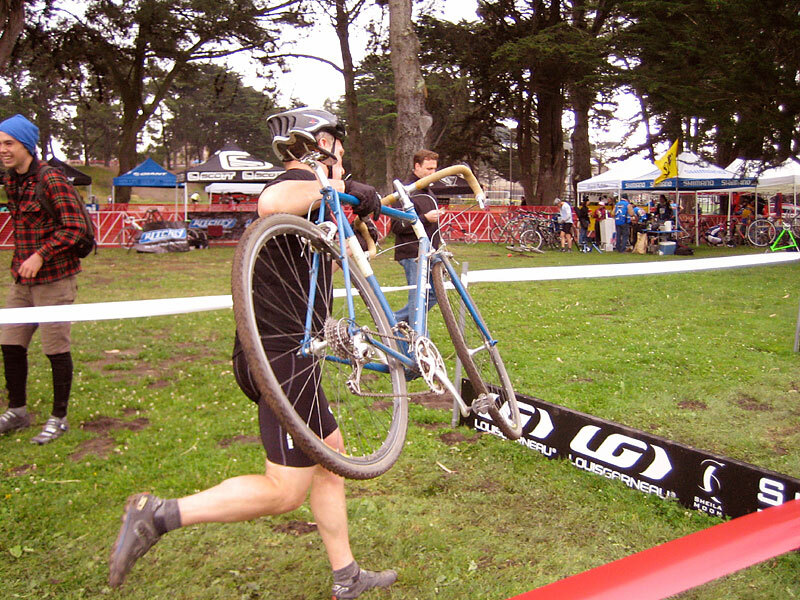 Mclaren Park CX Race - 2008 from Cyclofiend on Vimeo. So, it’s Candlestick Park in a couple weeks! 1. You simply HAVE to print up the best photo of yourself at this race, autograph it and send it up here. It will get framed and hung on the wall of my home workshop where almost no one will ever see it but it will still be cool. ROCK STAR! 2. The gal who’s in Extra-Action Band? Come to Portland and check out a March Fourth show. They will blow your mind harder, I guarantee it. Congrats on your race! The whole Man In Black thing is a nice touch. 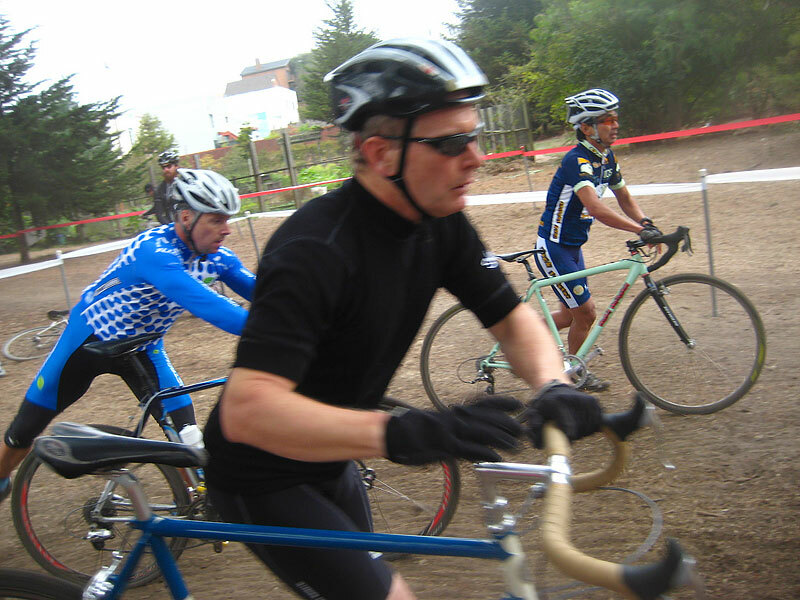 You couldn’t pay me to race cross — I’d die — but you sure look impressive doing it. Bravo! Extra-Action came in through the audience at the David Byrne show in SF. Lotsa attitude and, um, atmosphere… It was just a weird syncronicity that squishy listed involvement in it. Cross and manic public drumming - who’da figgered the intersection. Maybe they’ll show up at the under-the-lights CX race next month. I will hold you to that invite, by the way! And it’s tough to find black jerseys, let me tell you. Thanks, thanks, thanks! October 22nd, 2008 at 11:28 am i feel like it does usually get better. but not on that course. good write up. i liked it! and that may woo video was great! i hadn’t seen that yet either. October 30th, 2008 at 10:56 am Thanks! I shall protect the kittens this weekend at C-stick Park! If you need a reminder of the good ol’ days go over to hans kellner’s page - http://www.hanskellner.com/videos/cycling.html - and scroll down to the DFL footage. Good stuff!